Posted on January 31, 2013	by A.R. I get far more excited than I probably should when January 25th rolls around, but I also tell myself that I have more than ample reason to allow myself a little ridiculous excitement. If you’re anything like me, you love literature, and you love Scottish culture. These incredible forces combine to celebrate the birthday of Robert Burns, the unofficial national poet/hero of Scotland, who wrote (and collected) countless poems, ballads, letters, and songs in the Scottish dialect, preserving not only a literary record of his incredible perspective of the world, but also Scottish culture and heritage. You may or may not be acquainted with some of his work ― A Red Red Rose, Holy Willie’s Prayer, Green Grow the Rashes, Address to a Haggis, Scots Wha Hae ― but there are very few folks who aren’t familiar with what is probably his most famous contribution to the international community, the penning of Auld Lang Syne, sung at every New Year’s Eve the world over (and curiously, from what trusted sources tell me, at closing time in most stores in Japan). As a poet-at-heart myself, Burns is an incredible inspiration, and I never tire of exploring the landscapes and characters of his literature, especially when it means learning a new Scottish phrase or two. I can’t say that I’ve been nearly as proliferous as he, literarily or otherwise ― he has an impressive record of wooing the lassies ― but one need not necessarily be to warrant indoctrination into his worldwide fan club. 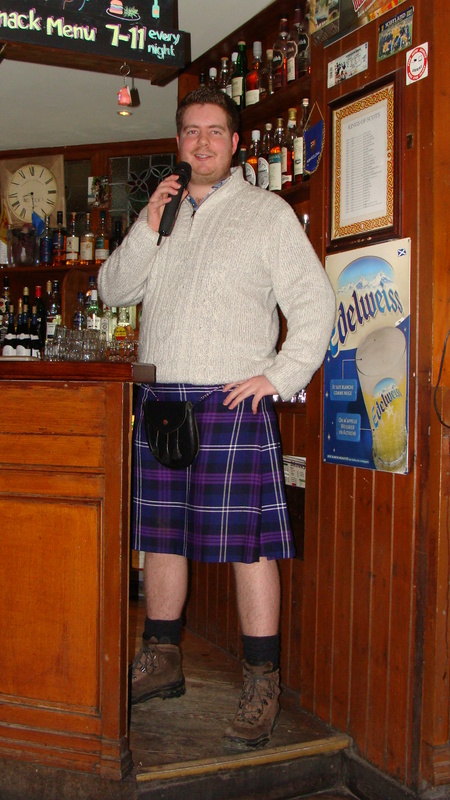 To the meat of my post: I had the honor of attending my first traditional, Scottish Robert Burns Supper last week for an enviable price at The Auld Alliance, a (some might say THE) Scottish pub nestled snugly into the fourth arrondissement right here in Paris. Yet again, I am overwhelmed by the opportunities this incredible city offers, and when an event inspired by my own cultural roots manifests, you better believe that I’ll be there! For some background, Ol’ Rabbie piqued my poetic interests just over a year ago, when I was still in my undergraduate studies and involved with our university’s Literary Society, so I took it upon myself to attempt to host a Burns Supper: it was an admirable effort, but after finally having experienced a truly traditional interpretation, I find myself rather humbled at my earlier attempt. Now, though, I’ve got the experience to properly organize another such celebration, should the future decree it! So on to the celebration! The Auld Alliance isn’t a massive venue, but it is certainly large enough to host a sizeable crowd of thirsty Scots, and there were more than a handful in attendance. It’s a cozy place with Scottish memorabilia all about, as you might expect. After a bit more socializing, our salad plates were clean, which means that we were ready for the main course! But we could not quite yet be served the famous, traditional Scottish dish ― not before the official procession of the haggis took place. In true Scottish fashion, the large and luscious pudding was paraded in on a silver platter, accompanied by a glass of whiskey and preceded by the pipes. After the march, a proper breaking of the haggis’ skin warranted Burns’ most mouthwatering poem, “To a Haggis,” or the “Address to the Haggis,” delivered by another young fellow (Simon, it would appear). This is an absolutely central part of the traditional Burns Supper, and usually the most well-received, since it means that the most filling portion of the evening will shortly be digesting. Only after those initial, magnificent deliveries could we enjoy the eagerly anticipated course: haggis, neeps & tatties ― that’s haggis, turnips, and mashed potatoes, quite the savory trio. These, served along with ample portions of whiskey: traditionally, a spot of the strong stuff is poured over the haggis itself, some might say to improve the flavor, though it’s not as bad as the world seems to make it out to be. I, for one (a recovering vegetarian, mind you) found it to be quite delicious! It had a lovely, spiced flavor, heavy on the pepper side, which always makes for a winner in my book. Having not eaten meat for some number of years now, the rare instance where I found such a morsel in my mouth (or even the smell alone of cooking meats) left a terrible memory on my tongue, but for some reason the haggis was rather at the other end of the spectrum, perhaps because it is composed of lamb as opposed to red meats like beef or pork, and furthermore because it doesn’t generally include the muscley, fibrous portion of the animal that is most commonly marketed and consumed. As the burly fellow in the video mentions, the haggis is akin to black pudding (black sausage, or in French, boudin noir) which relies on pig’s blood for its main proteinous ingredient and substitutes barley for oats. Where were we? Ah yes! The main course. As we chowed down, our hosts shared with us another central axis of the celebration: The Immortal Memory, a personalized tribute to Rabbie Burns and the incredible impressions he has left upon the world. 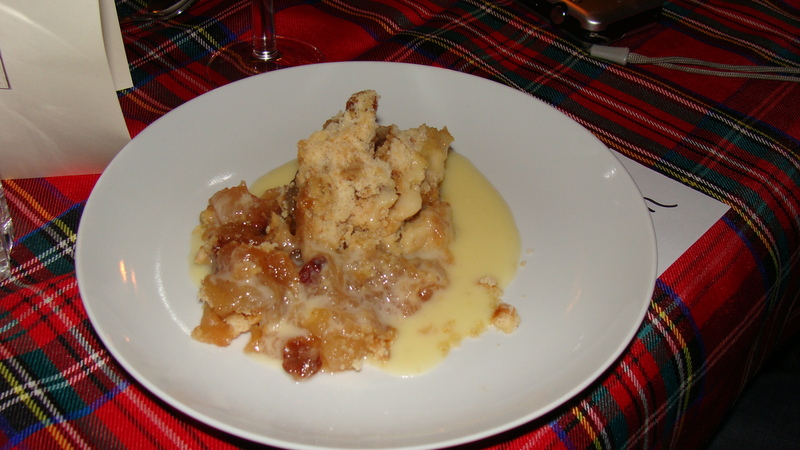 This part sees the most change from supper to supper, as it is truly up to the dinner’s host to decide how best to immortalize the Scottish Bard, and we received (as you might imagine) a humorous, but very informative, historical lesson. Sadly, I was worried that too much video would quickly fill my camera’s memory, so this is one that I did not record. It was one of the longer ones, too. I did, however, capture the piper’s version of Robert the Bruce’s March: if I understand correctly, it is also the tune to Burns’ “Scots Wha Hae,” a poem inspired by Robert Bruce’s address to his army before the battle of Bannockburn against the English (Bruce is arguably THE national hero of Scotland who led his people on their march toward freedom from the English crown). Curiously, I am told that the French military used to play this tune during final inspections of the troops, and may continue to do so today. Again, can’t beat that old-time friendship and cultural exchange! Needless to say, I had an absolute blast! Once again I find myself counting the very many blessings I have here in Paris. I even managed to make it to a second Burns gathering at another Scottish pub, The Highlander, but there was no wonderful ceremony nor traditional celebration. Regardless, I was more than content to soak up the atmosphere (and a couple of Guinnesses), and doubly happy to find that the haggis was free for those wearing kilts – which, as should now be well-established, is every day of my blessed life. 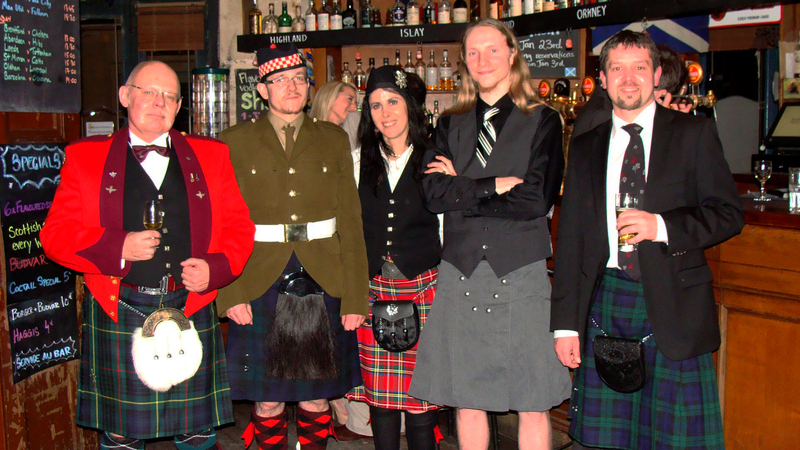 I’d like to wrap up the dinner portion with one of my favorite photos of the evening, because how can a photo with five kilts in it not be your favorite? If you’d like a little more information about Burns, the following video from the official “About Scotland” organization gives an elementary introduction, but at their website here you’ll find even more resources about the man and the celebration.